Looking For Orthodontics In Wharton? Consider This First! Did you know that over 4 million people in the U.S. wear braces each year and that 25% of them are adults? That means that if you have crooked teeth and are considering orthodontics in Wharton, you’re in good company! Straightening your teeth can greatly increase your confidence in your appearance, which has a ripple effect in your personal and professional life. Not to mention that it’s easier to keep your teeth and gums healthy because they’re so much easier to clean! But what should you consider before making your decision and are there alternatives to braces that can still give you the same result? Keep reading for the answer to both of those questions! Comments Off on Looking For Orthodontics In Wharton? Consider This First! Scheduling dental visits shouldn’t be a daunting task, but when you don’t have dental insurance or simply don’t understand your plan, it can make you avoid the situation all together. Whether you need to clarify the difference between an HMO and a PPO or figure out a plan for getting your restorative work done, your Wharton dentist has a quick guide for you to refer to here. Dental Emergency? Your Wharton Dentist Helps Save Smiles! When faced with a dental emergency, you need to think fast. Your smile is on the line! The quicker you react to emergencies, the more likely you are to recover your beautiful teeth and gums. Do you know what to do if an accident happens to your mouth? Who should you call? Have all questions answered today from your local Wharton dentist in this week’s blog post. Comments Off on Dental Emergency? Your Wharton Dentist Helps Save Smiles! There are many patients that avoid seeing their dentist but can’t explain why other than the feeling of fear. The official name for this feeling is dental phobia. Dental phobia is a real issue for patients and can be the start to the decline of their oral health. That’s why your dentist provides helpful sedation dentistry to help patients receive the dental care they truly need. 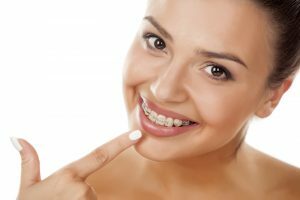 Is There a Dentist Near Me Providing Adult Orthodontics? More adults are choosing to straighten their teeth with braces than ever before. Whether that’s because image is of increasing concern or because there are better options in orthodontics, we’ll never know. 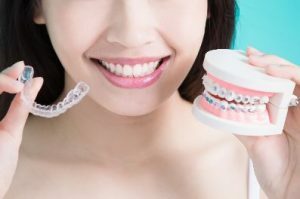 It’s probably a combination of both — because with solutions like Invisalign and Fastbraces, you don’t have to deal with the stress or potential embarrassment of wearing metal brackets and wires any more! If you’d like to benefit from subtle orthodontia, call off the search for a “dentist near me” and learn about your options at Dr. David Tripulas’ office. Comments Off on Is There a Dentist Near Me Providing Adult Orthodontics? If you have a missing tooth or teeth, then you don’t need me to tell you what kinds of problems they can cause. Often, people feel extremely self-conscious about the gaps in their smile, and even worse, it can prevent them from speaking clearly or enjoying their favorite foods. Over time, they can also make a person much more vulnerable to developing gum disease, which in itself is the leading cause of tooth loss in the world! Although you’re embarrassed to admit it, you’re afraid of the dentist. It all started when you were a child and you saw a provider who had a gruff chairside manner. You remember being tilted back in the chair without warning and the shrill sound of the drill that prepared your teeth for a filling. And, since you didn’t receive enough numbing agent, the pain was intense. Flash forward to your life as an adult, and it’s no wonder that you avoid going to the dentist unless things are out of control. But it doesn’t have to be this way. 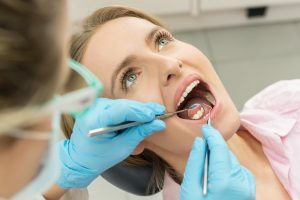 Dental anxiety is exceedingly common and that’s why Dr. David Tripulas, your compassionate dentist in Wharton, offers safe sedation dentistry to keep you completely at ease at every dental appointment. Learn more about dental anxiety – and what you can do about it – in this post. 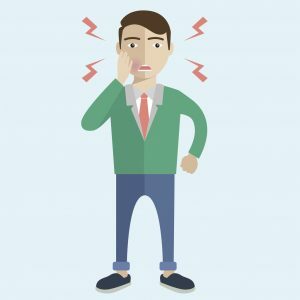 You’ve had it with your jaw pain – as if the clicking and popping weren’t enough, your TMJ started to act up during a meeting at work and your jaw got locked in an open position, causing extreme pain and embarrassing you in the process. 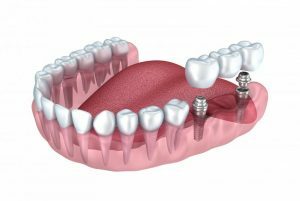 You want to address this problem as soon as you can, and with treatment from your dentist in Wharton, you can get the relief you need. 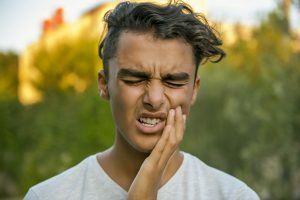 In this post, the team at David Tripulas DDS explains how they can help with jaw pain from grinding your teeth and TMJ dysfunction. Did you know that on average, 1 in 6 Americans experience dental emergencies every year? These dental accidents are more common than you’d think. 72% of Americans have fillings, caps, or crowns and about 23% of dental emergencies end up relating back to their dental restorations. Your emergency dentist in Wharton wants you to know what to do when you’re faced with a common dental emergency. Thankfully, statistics show that 67% visited their dentist after their dental emergency occurred. But, there’s always room for improvement. We want all patients to be well informed and able to make the best decision for their oral health.